It was another busy day in the Minnesota Twins minor league system. Each of the affiliates played. Zander Wiel recorded his first Rochester hit. Clark Beeker was solid in his first Double A start. Alex Kirilloff kept up an impressive streak while Taylor Grzelakowski continued an impressive season with another strong game. 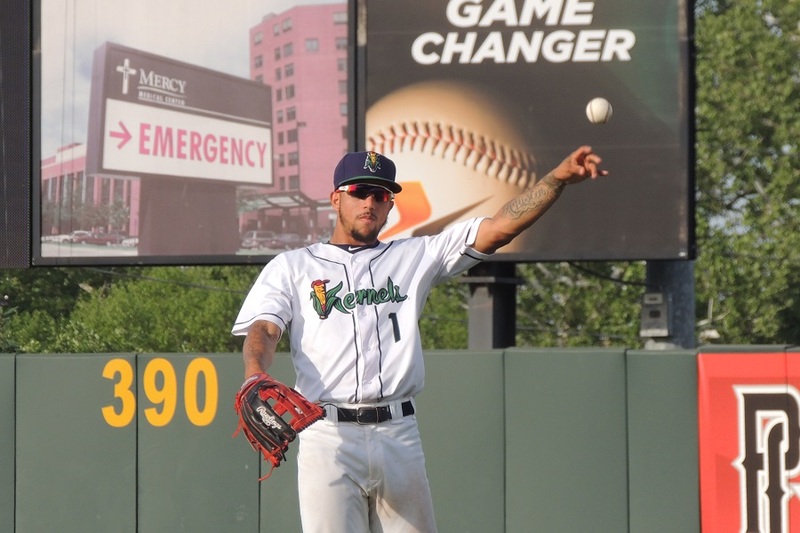 Akil Baddoo and Trevor Larnach powered the Kernels to a win. The E-Twins needed 11 innings and got great relief work from Jacob Blank while Jean Carlos Arias had a couple of big hits. The GCL Twins tried to come back from a big deficit in a rare night game in the Gulf Coast League. Keep reading to find out more on the night in the Twins minor league system on Wednesday. As always, please feel free to discuss and ask questions. Utility man Taylor Motter was released by the Twins. He’d been playing in Rochester. Fernando Romero was on the mound for the Red Wings. The right-hander went the first three innings. He gave up three runs on four hits. He walked a batter, hit a batter and struck out two in three innings. Tyler Duffey came on and gave up two runs on four hits in two innings. He struck out three. Ryne Harper gave up two runs on three hits over 2 2/3 innings. He walked two, hit one and struck out two. John Curtiss got the final four outs. Kennys Vargas had another strong game. He went 2-for-3 with a walk and his 16th double. Zander Wiel had a hit in his fist at bat, the first hit of his Triple-A career. Byron Buxton went 0-for-4 with two strikeouts. Clark Beeker made his first Double-A start for the Lookouts on Wednesday night. The right-hander from Davidson gave up just two hits over four shutout innings. He struck out two without issuing a walk. Anthony Marzi came on and worked the next two innings. The left-hander gave up one run on two hits and a walk. Tyler Jay worked the final two innings and gave up two runs (1 earned) on two hits, a walk and a hit batter. The Lookouts had just five hits in this game. Jaylin Davis provided the offense with a two-run, first-inning homer, his sixth with the Lookouts. Brent Rooker had a single and was hit by a pitch. Andro Cutura missed nearly two seasons after Tommy John surgery. On Wednesday, he turned 25 and celebrated with a Win. The right-hander gave up just one run on four hits in seven innings. He walked three and struck out four. Adam Bray gave up two hits over two scoreless innings to end the game. Taylor Grzelakowski led the way with a 3-for-5 game. He hit his 23rd double. Mark Contreras went 2-for-4 with a walk and his 15th double. Eddie De La Trinidad was 2-for-5 with his second double. Ben Rortvedt went 2-for-4 with his seventh Miracle double. Caleb Hamilton went 2-for-3 with a walk. Ryan Costello also had two hits. Alex Kirilloff extended his on-base streak to 33 games. Jose Miranda also doubled. Akil Baddoo paced the way early for the Kernels. In the first inning, he began the game with his 11th triple. An inning later, his 11th home run was a two-run shot that was the big hit in a five-run inning. Baddoo also walked once. Trevor Larnach went 3-for-5 with his sixth double and his second home run. Michael Helman went 2-for-4 with his third double. Michael Davis went 2-for-4 with his eighth double. Trey Cabbage knocked his 19th double, which Ben Rodriguez’s first triple drove in two runs. Blayne Enlow made the start. He gave up one run on four hits over five innings to pick up his third win of the year. He walked one, hit two and struck out eight batters. Jared Finkel went the next 2 2/3 innings. He gave up three runs on five hits and a walk. Derek Molina got the final four outs and gave up just one hit. Jean Carlos Arias has struggled since being demoted to the E-Twins. He had an early single. In the ninth inning, he singled in the game-tying run. And in the bottom of the 11th inning, he singled in Trevor Casanova with the game-winning run. DaShawn Keirsey had a single and two walks. Tyler Palm had another strong start. The lanky right-hander started with six scoreless innings. His final line was one run over 6 1/3 innings. He walked one, hit one and struck out four. Augustana University’s Jacob Blank came on and gave up just one hit over the final 4 2/3 innings. He intentionally walked one and struck out five to record his first professional win. The Twins played a rare night game in the Gulf Coast League. A six-run fourth inning put the Twins in a hold. However, in the seventh inning, they mounted a comeback. They scored six runs of their own to tie the game. However, in the bottom of the inning, they gave up what proved to be the game-winning run. Prelander Berroa started and gave up seven runs (just two earned) on eight hits and a walk over the first 3 2/3 innings. He struck out four. Denny Bentley came on and finished out the fourth and worked a scoreless fifth inning. Steven Cruz gave up one run on one hit and three walks over the next 1 2/3 innings. He struck out two. Petru Balan got the final four outs. He gave up one hit, walked two and struck out one. Shane Carrier had two doubles in the game. Estamy Urena was 2-for-4 with a walk. Victor Tademo also had two hits in the game. Twins Daily Hitter of the Day: Jean Carlos Arias, Elizabethton Twins (3-5, game-tying and game-winning hits). Please feel free to ask any questions about Wednesday’s games, or ask any questions you may have. Pretty sad when the 33rd round guy who got nothing (Beeker) does ten times better than the 3.8 million dollar 1st rounder (Jay). The funny thing about baseball is that this happens just about every day across every system. The only thing that could have bettered that headline was if he had defeated a team called the Blankets! Going to be interesting come November to see if the Twins put Jay on the 40-man roster.Certainly doubtful based on his performance.Would he be lost if they don't? Romero is now past his innings from last year.Looks like he is again running out of gas.Don't know what to think about Grz, sure is doing well in his first season of professional ball.And isn't it great seeing Rortvedt finish strong?They have the Miracle only a half game out of a playoff spot. With time running out, the Kernels have a 4.0 game lead to make the playoffs.This is an exciting roster and should be fun to follow their playoff run.Was Enlow's 8 K's the most of his career? I think you nailed every one of my thoughts. My predictions would be no and no. He's not the guy the Twins drafted. Injuries have taken away a ton of his stuff. He's left-handed, so I guess I'd never say never. Was Enlow's 8 K's the most of his career? Yes... previous high was 6. Also... Jay has suffered through injuries that most likely have sapped his ability. We shouldn't blame a guy because his body fails him. Ifyou're the White Sox, why not take a look at him? If you don't like him, you can give him back but I'd think some team would want to see if they think they can fix it. Apparently, he still hits mid 90s. I dunno. I certainly don't envy this decision. My gut feeling is that he is left off, but that the FO still wants him around to see if he can get fully healthy. Being left off could also mean that another team may also take that chance and try to catch lightning in a bottle (not likely, but it is possible). I talked to a scout that saw him in late July, had Jay clocked at 91-93 mph. I just wouldn't be real worried about losing Jay at this point. More important guys to protect. I actually agree. I don't think he should be on the 40 man but if I were another team, he's the type of guy you might take a flyer on, depending on how many spots you have open on your roster. 'Course, I said the same thing about Stewart and Bard last year and was right on one and wrong on the other. I would guess that Andrew Vasquez has passed him by in terms of 40-man roster pecking order... though not protecting Jay would make him a solid, maybe even strong candidate to be selected. Correct... we have a tendency to blame the player... It could be the injuries have taken away some ability. It could be that he just shouldnt have been drafted where he was in the first place... but he can't just say no. I know I wouldn't. We have this tendency, I think, to place struggles on the field with some sort of character flaw, and that's not fair at all. I often hear people say that Player X "didn't reach his potential." Well, maybe that player did. The truthful saying would be that Player X "didn't reach his perceived potential" or "didn't reach what I wanted him to." Disclaimer: I personally haven't' given up on Jay. He's made it through this season relatively healthy. Maybe he gets a full offseason and takes a step next year. For the record I don’t blame Jay the person for sucking. Things happen. It isn’t personal. But hitting batters, walking guys in crucial spots, it’s about stuff, it’s about control. And that stuff is often mental not physical. I’m sure he’s a fine guy, he just didn’t work out. Just like Kohl Stewart is also a first round mistake. It’s just not going to happen I’m afraid. The sad thing is that it keeps happening over and over with Jay. I thought at least he'd be a MLB RP by now. That seemed like a lock. I'd probably leave him off the 40 man, but I'm not sure. He's on the bubble/line with some other players. First rounders fail at such a high rate I'm not sure if it is even reasonable to ever call a pick a mistake. There should be a word (lucky?) for when a team does pick someone who actually becomes a good MLBer. Jay is doubly unfortunate, in that Benintendi was taken directly after him, and because his supposed floor--at least in my mind--was a solid MLB reliever. You wonder if they hadn't monkeyed around with making him a starter, if he wouldn't have stayed healthy and reached that floor. And he still can, by all means. The lede could be this--"Jay, finally healthy, is blowing hitters away with his mid-nineties heat heat from the left-side. Consider this another win for a Dodgers organization that has previously plundered the Twins organization for quality relief pitchers." I don't think anyone is saying it's a mistake from the standpoint that he didn't turn out. It was a mistake to take any relief pitcher in that spot because it is not a good value for a #6 pick. The most realistic ceiling from that is a decent MLB reliever for 4-5 years (starting was a pipe dream). If he doesn't make it then he's out of the league and you completely lost the investment, whereas a position player or starter may salvage some value by falling back to a reduced role. Also, Rortvedt now OPS'ing 720 with an OBP of 347.At a place/league were offensive numbers are typically a bit depressed.In his 20-year-old season.As a player that most (not all) analysts have considered a glove-first catcher up to this point.I would have to think that this is viewed as a very encouraging year for Rortvedt within the organization. Maybe people saw this on Twitter, but Andrew Vasquez was promoted to Rochester today. Casey Crosby off the DL for Chattanooga. I think I’d have gone with Larnach and Enlow for the POD’s. Seth, have you ever gone through and done a player of the day leaderboard? Over his last ten games, Vargas is hitting.432 with 5 jacks and 16 RBIs. Small sample size, but whatever he’s doing, let’s get Sano doing the same. Is Vargas on the 40 man and will se see him September 4th? WWBD. or,what would Baltimore, the currently worst team in MLB do? They’d have first choice at the waiver wire. Would Jay be an improvement? Probably. Excuse my naïveté but are Kernles games available online?